WINSTON-SALEM, N.C. (Reuters) - Evangelist Billy Graham's voice is softer and his body weaker, but the man who helped transform Christianity in America and counseled U.S. presidents will reach out to the nation on his 95th birthday in an effort to revitalize the Church. Graham, who has not preached publicly since 2006 because of frail health, has filmed a public message to air on national television on his Nov. 7 birthday, giving fans a rare and possibly final opportunity to see the man dubbed "America's Pastor." "Our country is in great need of a spiritual awakening," Graham says in a program titled "The Cross." "With all my heart, I want to leave you with the truth." Graham's message is at the heart of what the Charlotte, North Carolina-based association bearing his name calls its largest evangelism effort in the United States in its 63-year history. It comes at a time when most U.S. evangelical leaders say they are losing influence, studies show Americans increasingly do not identify with any religion and many young people are unaware of Graham's legacy. "The students that I teach don't really know who Billy Graham is," said Anne Wills, a religion professor at Davidson College outside of Charlotte. "They don't have any idea about the scope of his influence." His son Franklin, who runs the Billy Graham Evangelistic Association, has been accused of injecting his father into recent politics in ways the elder Graham had carefully avoided. Franklin Graham said filming the telecast at his mountain home in Montreat, North Carolina, was difficult for his father, once called "God's Machine Gun" for his thunderous oratory, but he wanted to share his gospel message once more. "My father is still living and he still has something to say," Franklin Graham said in a phone interview. "If we don't do it now in this country, we'll never get a chance to do it with him." As part of the "My Hope America" campaign, Christian believers from more than 24,000 U.S. churches will invite people into their homes and congregations to learn about their faith from a man considered one of the most important figures in modern religion. Billy Graham pioneered a new kind of Christianity during seven decades in the pulpit, bringing Jesus Christ to the masses via fiery crusades in tents and big-city stadiums, visits to remote overseas villages, and a ground-breaking use of media. He preached to more people in live audiences than anyone else in history, according to his association, and was the first noted evangelist to take his message behind the Iron Curtain, preaching in countries living under Communist rule. He also met with numerous world leaders and every U.S. president since Harry Truman, growing close to several. The impact of his latest efforts - including the mid-October publication of his 32nd book, "The Reason for My Hope: Salvation" - remains to be seen. A 2005 Gallup Poll revealed that 45 percent of young adults were not familiar with Billy Graham. And one third of adults under 30 consider themselves religiously unaffiliated, according to a 2012 Pew Research Center report. The new broadcast, which features clips from Billy Graham's prime preaching days and faith testimonies from two young musicians, is aimed at audiences of all ages, his son said. Some scholars and observers say the tone of Graham's evangelism organization has changed under his son, who became chief executive officer in 2000 and aligns himself politically with religious conservatives in a way Billy Graham grew wary of in later years as he sought to broaden his reach. Last year, Franklin Graham rejected accusations that he orchestrated newspaper advertisements ahead of the presidential election that featured Billy Graham urging voters to choose candidates with biblical values and appeared to endorse Republican candidate Mitt Romney without naming him. Franklin Graham said his father felt compelled to speak out on moral issues, but critics said the partisanship was out of character. 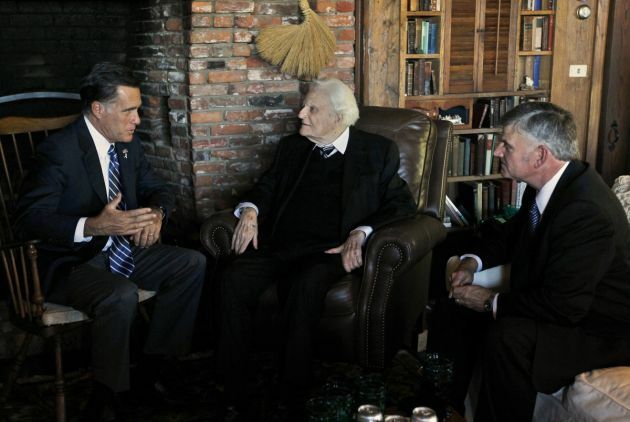 Although strongly anti-Communist, Billy Graham mostly stayed clear of politics. A friend to civil rights leader Martin Luther King Jr., he eventually refused to hold segregated meetings. "The more Franklin goes on Fox News and the more he takes stands on homosexuality and his views about Islam, he is changing the way that people are looking at the ministry that has Billy's name," said Ken Garfield, who recently published a book on the elder Graham. But Garfield said the association's use of the Internet, home viewings and other media honors Billy Graham's legacy of employing television and other platforms to spread his message. "Franklin is absolutely modernizing the way they tell their story," Garfield said. "The basic message of salvation through Christ remains the same, but a lot else is changing." On Nov. 7, the elder Graham will mark his birthday at a party at the Grove Park Inn in Asheville, with political and church leaders among 800 invited guests, Franklin Graham said. He recalled how guests at Graham's 90th birthday chuckled when the aging preacher invited them to return in five years to celebrate his next milestone.